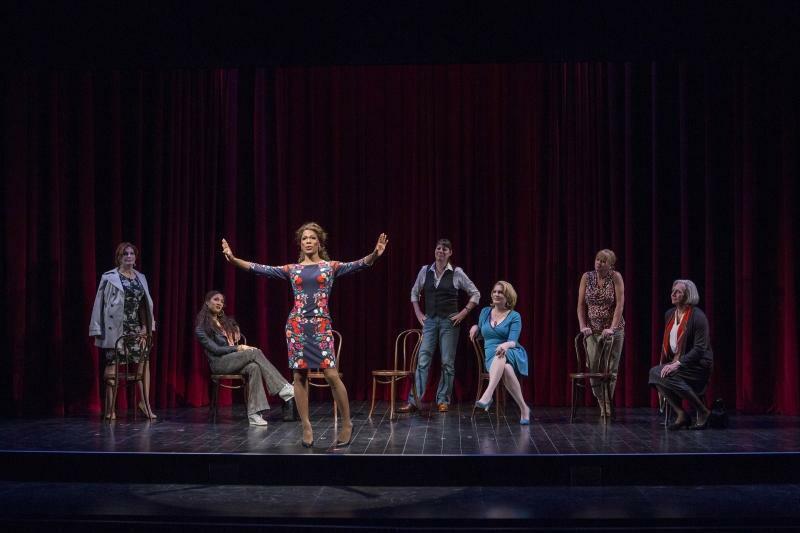 “Trans Scripts” is making its US premiere at the American Repertory Theater. CAMBRIDGE — When the lights go up on “Trans Scripts, Part I: The Women,” seven actors are sitting in a row of simple wooden chairs, a tableau reminiscent of the hopeful dancers in “A Chorus Line.” A blonde in a blue dress crosses her legs demurely. A senior citizen sports a white bob and practical pumps. Another wears blue jeans and a vest. A young Latina exudes self-confidence. An African-American sister has a mane of killer curls and stiletto heels that would make many a woman wobble. It’s a powerful image, rich in its diversity and strength. And the play that follows is equally potent. “Trans Scripts,” which debuted at the Edinburgh Festival Fringe and is making its US premiere at the American Repertory Theater, interweaves the stories of seven transgender women and celebrates their lives. Playwright Paul Lucas, who is also a theatrical producer, culled the piece from more than 75 interviews he conducted with trans women around the world, and the play is a moving testament about the search for self-identity. The production is fast-paced, funny, intelligent, human, and, for the most part, free of polemics. There is nothing sensational going on here: These are just seven individuals on a journey of self-discovery. The play unfolds in stages, exploring the early lives of children who felt they were born in the wrong body, their experiences with teasing and taunting, their dances with depression, and their ultimate definition of self. The seven actors take turns talking, and together, they create a portrait of people who are simply trying to be themselves. Their stories intersect and diverge, but the common theme is humanity. An intersex child is beaten by her father. A boy who doesn’t fit in is sent to therapy and told to lie to peers about it. A British doctor plays a “hiding in a corner game” as a youngster. When the characters finally reveal their true selves, they are told that no one will ever love them. Some resort to self-medication. Others take up dangerous hobbies or drive like maniacs, hoping to meet their maker. Some marry and end up staying together. Others split with their partners. The play underscores the similarities of these women, but more importantly, explores their individuality. One character says she is Jewish, and the thing she thinks about most when reconnecting with her mother is not that she is trans, but that she eats bacon sandwiches and has a Christmas tree. Another recalls going back to church and hearing the pastor call out the gossips in the congregation. And a British gynecologist enjoys the fact that she is discriminated against as a woman because it validates her identity. Amusing, yes, but scary too. Enough said. The cast is a mix of trans and cis actors who take turns talking. Together, they create a portrait of people who are simply trying to be themselves. Marlo Bernier just wants to be a woman. Matthew Hancock wears those heels as Zakia and survives “The Jerry Springer Show.” Eden Lane is lovable as she describes her first date with a man. Bianca Leigh, whose perfect hair is enviable, makes you want to be her BFF. MJ Rodriguez is an activist and a survivor. Rebecca Root is salt-of-the-earth as the intersex Brit. And Jack Wetherall is a doctor any woman would trust. Director Jo Bonney and the creative team move the play along at a fast pace, bringing these women’s lives front and center in a way that demands understanding. There is not a hint of grandstanding or self-pity. The only time the action halts is during a short scene where the characters give a history of gay rights, invoking Stonewall. The scene is forced and unnecessary. We get it. The rest of the piece is about who these women are and how they got there. And their paths were not easily navigated. They talk about passing as “a confidence trick.” They acknowledge that there is no simple universal narrative. Every person, whatever their gender identification, goes on a search for self. These women note that this journey takes “a lot of strength and courage.” This is not just about gender identity. It’s about what makes us human.